Billing Boats has been making quality wooden model boat kits for over 50 years. Although we are offering a choice selection of historical wooden viking ship models on our website, we have access to the entire Billing Boats catalog including RC "remote control" wooden boat models, RC controllers, paints, accessories etc. Please contact us for a price if you are interested in items not listed on our site. The Viking ships were the high technology of their time. They allowed the Vikings to dominate much of Europe for more than two hundred years as they traveled hundreds of miles trading and raiding. 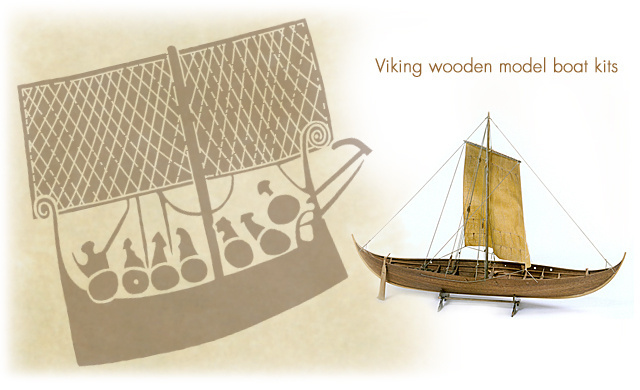 Norse shipbuilding was a tradition that began before the first century BC. Norway is still a major player on the international arena of shipping and boat building. Today Norway has the world's third largest fleet of commercial vessels. It is common knowledge that the Vikings were the masters of the seas. It was the perfection of the sailing long ship that heralded the beginning of the Viking Age, about 800 AD. Without these great ships, the outstanding achievements of the Viking Age would not have been possible. The Norsemen sailed great distances and found colonies and kingdoms in Normandy, the Orkneys, the Shetlands, Ireland, Scotland, England, Iceland, Greenland and North America. The Vikings led by Leiv Eiriksson arrived in North America some 500 years before Christopher Columbus. The “dragon of the seas” had to be sufficiently stout and seaworthy to cross the North Sea even in a storm; but at the same time they had to be light enough to be hauled long distances on land if need arose. They were designed to be fast troop carriers, built to land on shore and sail into shallow rivers where no other ships could go. They were not made for naval battles on the water, but to implement hit and run tactics, which made the Vikings legendary. Viking ships seemed to appear out of nowhere, strike with brutal landing parties and then disappear as quickly as they arrived. Several Norse innovations derived from their understanding of the natural elements and engineering made the Viking ships truly unique. The first was strength. The Vikings searched for trees that matched the shapes that they were creating. By matching the natural curves and grains in the wood to the ship components they were able to maximize the strength of each piece. The keel (or ship’s backbone) was made from a single piece of oak, which gave the ships great stability. This also allowed the ships to have a natural torque in the water. The ships didn’t float as a single rigid structure competing against the strength of the waves. The ships had a give and take that allowed them to twist with the waves and not fight them. The front and back of the boat could be twisting in opposite directions in a natural manner that rolled with the waves. This helped to absorb the impact of the waves much like shock absorbers work on our cars today. Another Viking innovation was speed. They achieved speed by building extremely strong and lightweight ships. They maximized speed through tightly knit sails, oars and the shape of the hull. The hull was designed to send the air bubbles that were created, as the ship cut through the water, directly under the ship. This use of airflow made the ships even more buoyant and lighter allowing them to pick up even more speed. The fast and maneuverable long ships could sail at over 7 knots (13km/hr). If the wind dropped, they lowered the sail and rowed instead. A raiding party could sail from Norway to England in under two days. No other ships of the day could come close to catching them. At first the same sort of ship was used for both trade and warfare. However, by the 10th century, ships were being built for special purposes. Short broad merchant vessels could carry up to 35 tons of cargo, including horses and cattle. Warships (the longboat) ranged from 60 to 90 feet long and had a minimum of 36 rowers, one per oar. Pine or oak was used as the primary wood in the ships. The sails were rectangular and often made of thin, light wool. A single starboard-side rudder controlled steering. The ship had a deck and cargo could be held below. They were water proofed with pitch. Some ships even had a stem that was carved with the proud head of a dragon. It is no wonder the people of Europe were terrified by the sight of the longboat.